FX has just announced the upcoming premier of the “final season” of The Americans, and I can only say that I am glad the Russians are no longer coming. Season 5 is being released on disc today, so I guess the advertising ploy for Season 6 is designed to re-whet whatever appetite you, like I, may have already lost. Mine certainly needed rewhetting, or at least a loooonnngggg respite, after the dismal conclusion of Season 4. About as exciting as watching paint die—a skewed metaphor not too far off from the subject matter of that season’s concluding episode—Season 4 managed to just about kill all the intrigue and tension generated through the program’s first three seasons. For those who don’t know, the premise of this Reagan/Bush-era Cold War drama is that the Soviets have planted deep-cover moles in the United States in the guise of ordinary families. The central characters of The Americans are a mother and father (Elizabeth and Philip Jennings) who run a travel agency while somehow managing multiple false identities… and rather surprisingly decent (if, um, duplicitous and misguided) parenting. 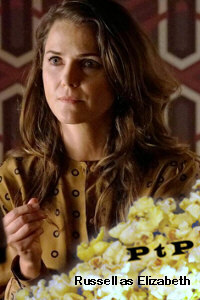 Keri Russell is very engaging as the mother, while Matthew Rhys is a revelation as the husband. At least, he was… until Season 3 threw him into EST therapy and Season 4 took him out of his most interesting spy-handling role. Sadly, Season 5 picks up just about where Season 4 left off, with Holly Taylor, as daughter Paige, angling for increased screen time and the various sprawling story threads making very little progress in each hour-long episode. Rhys is reduced to about a single exhausted expression while Taylor gamely struggles to establish something resembling three-dimensionality. The major story thread is an entirely new fake family for the Jenningses to manage while they cultivate contacts related to an American plot to sabotage Soviet wheat crops. But it’s so hard for the writers to summon up any narrative tension, what with extended discursions each episode into Agent Beeman’s rambling FBI investigations, Oleg’s new job strong-arming grocery retailers back in Moscow (yeah, that’s pretty exciting), new “son” Tuan’s reminiscences of war-years Viet Nam, Paige’s teen romance with Matthew Beeman, and fresh excuses for why we rarely see real son Henry. When Liz and Phil manage to get a few minutes for romance, even that seems stale. So you’re probably wondering why I’m bothering to write about this, given how dull and rote it all is in Season 5. This is the reason: I still recommend Seasons 1 through 3, which were some of the best TV going at the time. The very first episode of Season 1 is honest-to-God one of the best hours of TV I have ever watched. So if you’re still a fan of the series, I can tell you that Season 5 promises more of what you got in Season 4. If, like me, Season 4 left you cold (or comatose), don’t expect Season 5 to revive you. And if you’ve never seen The Americans, start fresh with Season 1 and don’t bother starting Season 4 when you get there! The Americans: Season 5 is now available to stream at Amazon Prime Video. You can rent the DVDs from Netflix.